While walking to the Jewish Museum of Berlin, off the Oranienburg Strasse metro stop, I came across a unique attraction leading to the museum. Looking down, I noticed little plaques with flags of EU nations on the pavement. I don't recall the name of this pedestrian mall, but 2 of these plaques stood out. 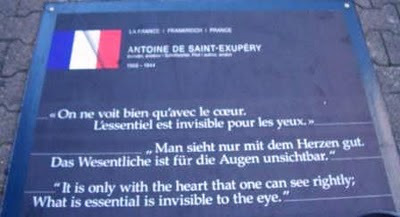 Antoine de Saint-Exupéry is best known for the Little Prince from where came, "It is only with the heart that one can see rightly; what is essential is invisible to the eye." Saint-Exupery happens to be a favourite author from my teen years. The title of this blog is from one of his books which I wrote about in my first post Where do I start. Don Quixote is probably better known than its author, Miguel de Cervantes. From that book came this passage, "Traveling and sojourning among various people makes men wise." which I borrowed to put in my profile. 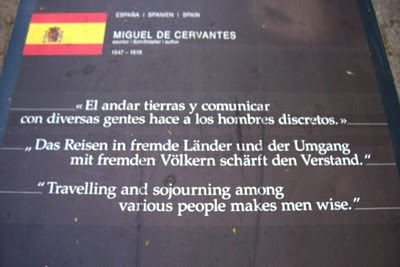 The walkway featured the most memorable and profound saying of an author, hero or statesmen of each country. At each step, one picks up a bit of wisdom along the way.